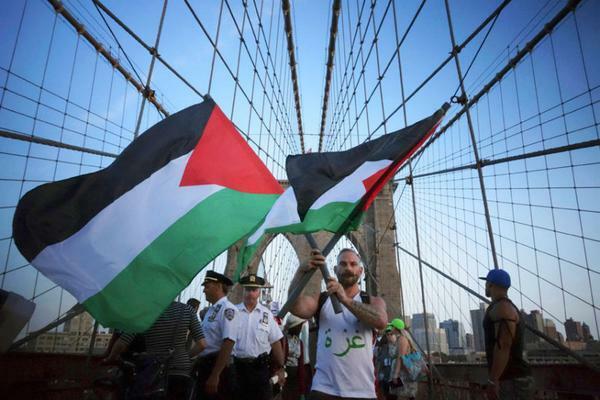 Across the U.S., people are rallying in support of justice for Palestinians. They’re doing it in small ways, like carrying a Palestinian flag to a game. They’re doing it in bigger ways, like conducting sit-ins and blocking ships. Some are veteran activists from the Civil Rights era. Others are Palestinian-American youth, returning from a summer under occupation. Most are everyday people moved to do something after weeks of Israeli atrocities that killed over 2000 in Gaza. Unfortunately, universities and law enforcement – under pressure from lobbying groups, donors and politicians – are increasingly suppressing speech supporting Palestinian freedom. Below is a roundup of summer incidents in which people lost their job, were investigated or otherwise sanctioned because they were critical of Israel’s policies, or merely expressed support for Palestinian rights. What these and other incidents Palestine Solidarity Legal Support has tracked have in common is that Israel advocacy groups frequently demand that individuals supporting Palestinian rights be investigated and punished. These groups often rely on false accusations of anti-Semitism. Donors or other high-powered individuals commonly conduct lobbying behind-the-scenes. Right-wing media outlets echo calls for punishment, asserting that criticizing Israel is anti-Semitic and accusing those who support Palestinians of supporting terrorism. Meanwhile, politicians introduce legislation limiting speech activity critical of Israel. This anti-Palestinian offensive recalls the McCarthy era when those perceived to be sympathetic to communism were subjected to intense retribution. It’s chilling, and aims to silence views that diverge from U.S. orthodoxies on Israel-Palestine. It’s also unethical, and action taken is often illegal. Palestine Solidarity Legal Support is tracking such incidents of repression. Our attorneys are supporting students, professors and everyday people who face severe personal and professional consequences, or fear that they will be punished, because the people whose freedom they support are Palestinian. The list is by no means comprehensive, and does not include cases we cannot discuss because people fear that publicizing their experiences will lead to more negative consequences. The University of Illinois at Urbana-Champaign revoked its tenured offer to Palestinian-American professor Steven Salaita because of his tweets criticizing Israel’s policies. The University de-hired Salaita after being lobbied by anti-Palestinian students, parents, alumni, a “multiple 6 level donor,” the fundraising arm of the university, and Zionist organizations. Palestinian-American professor Rabab Abdulhadi was forced to defend research and travel to Palestine after the Amcha Initiative falsely accused her of abusing state funds in a bullying campaign. San Francisco State University cleared her of wrong-doing, and the Dean of the College of Ethnic Studies came to Abdulhadi’s defense in June. A public library in Evanston, Illinois canceled a book talk by Palestinian-American author Ali Abunimah in order to “balance” the event with “pro-Israel” speakers. After outcry over the censorship, the library reissued the invitation. A professor at a public university discovered that the university investigated him after receiving complaints that his research was critical of Israel. The FBI pressured a student who had organized events criticizing Israel’s human rights abuses to meet for questioning. Los Angeles City Councilmember Bob Blumenfield introduced legislation urging the University of California to punish and report to law enforcement students who ask campus leaders to adopt an “ethics pledge” and decline trips sponsored by lobbying groups with a history of discrimination, such as the American Israeli Public Affairs Committee and the Anti-Defamation League. Temple University placed Students for Justice in Palestine (SJP) under investigation after a student near the club’s table slapped another student at a Welcome Week event. SJP condemned the slap, stated that the assailant was not an SJP member and refuted claims that anti-Semitic remarks were made. A private university placed a Students for Justice in Palestine chapter under review after coming under pressure from donors. The Department of Homeland Security opened fire on Palestine solidarity activists in Los Angeles after Israel supporters “stomped and kicked” a Palestine protester kneeling to pick up a Palestinian flag. Philadelphia police told a group protesting Israel’s war crimes in Gaza that it would arrest a young Arab protester unless the protesters dispersed. The protesters went home. The Boston Transit Authority pulled ads critical of Israeli apartheid for “demeaning” the State of Israel. Californians conducting a peaceful sit-in at Senator Diane Feinstein’s office were arrested and held for over twenty hours before suddenly being released. The activists were calling on Senators Boxer and Feinstein to support an international inquiry into Israeli war crimes in Gaza. Police handcuffed and threatened Palestinian-American author Ali Abunimah as he interviewed and filmed participants at a pro-Israel rally in Los Angeles. A federal judge who donated millions of dollars to the State of Israel initially refused to recuse himself in the deportation case of Palestinian-American community leader Rasmea Odeh; a case which turned on testimony that Rasmea was tortured while in Israeli detention. Judge Borman ultimately recused himself after revealing family business interests related to the case. Despite these disturbing examples of ways in which everyday opposition to Israel’s policies is affecting individuals, it is undeniable that calls for Palestinian rights are increasing. PSLS’s role is to defend those who are attacked, and expose efforts to shield Israel from accountability as just that – desperate attempts to whitewash and justify decades of colonialism, occupation and apartheid by muzzling those who speak out for justice. To view this article on Mondoweiss, click here.